Change is hard. It’s hard enough to change your own behavior, let alone the behavior of fathers who aren’t as involved in the lives of their children as they should be. 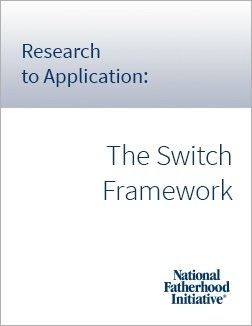 The challenge inherent in encouraging and initiating behavior change among fathers—and eventually helping fathers maintain behavior change—is why the Switch Framework is such a powerful tool in NFI’s programs. Indeed, it is the framework upon which we’ve built our evidence-based 24/7 Dad® and InsideOut Dad® programs. This practical, research-based, powerful framework is described in the book Switch: How to Change Things When Change is Hard . The framework will help you understand how to help fathers change their behavior by acknowledging that they have an emotional side (the “Elephant”) and a rational side (the “Rider”). It will help you reach and appeal to both sides and show fathers how to become the best fathers they can be given their unique circumstances. You can use it in your work with fathers regardless of how you work with them (e.g. in a group-based or one-on-one environment), an dthe level of depth at which you work with them. The reason NFI chose this framework for our programs is because becoming an involved, responsible, committed father is extremely difficult for some fathers, especially fathers who are non-custodial and non-residential and who face other challenges to being involved (e.g. unemployment, owe child support, and have a poor relationship with the mother of their children). Our programs do the three things below to help these and all fathers successfully change. Think about how you can implement them in your own work. Direct the Rider: Provide clear direction to fathers’ rational side on how to become an involved, responsible, committed father. Fathers can sometimes appear to be resistant to change when, in fact, they lack clear direction. They simply don’t know how to be a good father. (Fathers who go through NFI’s programs often remark that they didn’t know they weren’t good fathers until they received this direction.) Show fathers what works and that they can apply what works. Focus on specific behaviors fathers must engage in—a script rather than vague ideas on how to become a better father. Point to fathers’ destination—to become an involved, responsible, committed father—and why it’s worth it to get there. Motivate the Elephant: Engage fathers’ emotional side by motivating them to become an involved, responsible, committed father. Fathers can sometimes appear to lack motivation when, in fact, they’ve become exhausted in their attempts to be a good father. Motivate fathers by helping them feel the importance of being a good father and making change manageable (i.e. small enough to see change is possible). Help fathers develop a sense of identity as a father. Help them see that change is possible, generally, and growth as a father is possible, specifically. Shape the Path: Help fathers become involved, responsible, and committed with a focus on developing habitual behaviors. Help fathers learn the importance of consistent involvement that includes actions they can take again and again until they become habits. Habitual behaviors become ingrained—a part of who fathers are. Consequently, they don’t tax the Rider or exhaust the Elephant. Provide examples of how to change: Look for examples (models) of fathers who have changed their behavior to become involved, responsible, committed. Then share those examples with the fathers whose behavior needs to change. Plenty of fathers have learned how to change when change was hard. Use these “bright spots” as shining examples. If possible, have these fathers share their stories of change. Tell fathers exactly how to change: Don’t leave anything to chance. Provide fathers with a script on what to change and how to change it. Focus on the actions and habits that will have the most impact (i.e. individual actions and habits that create massive change). Emphasize the goal: Keep the goal of becoming an involved, responsible, committed father in the forefront of the mind of each father. Help each father develop an objective or two that will help him to reach this goal and continually hammer them home. Consider creating a laminated wallet-size card with the objectives on it that a father can keep on hand or put on his refrigerator, bathroom mirror, or anywhere else he might often see it. Consider having fathers identify an inspiring image (picture) that encapsulates what reaching this goal will look like or symbolize that they can also keep on hand or post. The image should inspire. Help fathers find the feeling: Help each father find the positive (not negative) feeling that will motivate him to change. Until fathers connect emotionally with the need to change, the understanding of the need to change (the intellectual aspect of it) won’t be enough. Fathers often know they need to change before they feel the need to change. Build a “father identity”: Fathers need to identify as fathers. That fact might seem painfully obvious, but until a man identifies as a father and considers that role to be of the utmost importance, it will be very hard for him to engage in the actions required to change. Help fathers grow into that identity—adopt that identity—so that they eventually embrace their fatherhood role. Instill a growth mindset: Fathers must believe they can change. Known as “self-efficacy,” a father must believe he can engage in the actions of an involved, responsible, committed father. Instill in fathers the belief that they can grow and will continue to grow as a father when they embrace that role. Help fathers change their environment: A father’s environment can create a lot of inertia that makes change incredibly hard. Especially in Western cultures, we like to think we’re the masters of our own destiny. While that’s true to an extent, research shows our environment has a lot to say about why we make the choices we make and behave in the way we do. Fathers need an environment conducive to change and maintaining change. Help them identify the aspects of their environment that keep them stuck and what they need to change about it (i.e. get rid of or introduce) to take the actions required of an involved, responsible, committed father. Start with small changes. Even one small change can make a big difference. Identify and build habits: Becoming a great father centers on developing the habits of one. Help fathers build frequently repeatable actions that engage them with their children in a way that considers their unique situation. For more on developing these habits, read the fifth guide in this series: Keystone Habits! Regardless of how you apply the knowledge of the Switch Framework, approach your effort as an experiment. Keep track of what works with fathers in general and with specific kinds of fathers (e.g. custodial and non-custodial) so that you can apply what works in future work with fathers one-on-one or in groups, and avoid what doesn’t work. Heath, C., and Heath, D. (2010). Switch: How to Change Things When Change is Hard. New York: Broadway Books. The book Switch: How to Change Things When Change is Hard by Chip Heath and Dan Heath. The website of the Heath brothers: heathbrothers.com. It contains several resources to help you get the most out of the Switch Framework. 3) Research to Application > Framing and the "No Choice Option"
4) Research to Application > The Power of The "Deviant Dad"
Click here for the full PDF of this post. The series offers a platform for generating dialogue among NFI, organizations, and practitioners on ways that research can be applied to addressing pain points in serving fathers. This post is the eighth one in the series. (The two-year anniversary of the series!) It provides ideas on how you might integrate the research-based Switch Framework. Integrating this framework could make you more effective in your work with fathers (e.g. facilitating a fatherhood program or working with fathers one-on-one).